15 March 2019 | Geneva -- WHO is convening an important global meeting to promote an integrated approach to address neglected tropical diseases of the skin. These so-called ‘skin NTDs’ manifest as changes in the skin. Awareness of the disease and the importance of early medical treatment are essential. The theme of the meeting is Enhancing detection of skin NTDs through integration. It will be held on 25–27 March at WHO headquarters in Geneva, Switzerland. 8 June 2018 | Geneva -- The World Health Organization (WHO) has published a training guide that aims to make it easier for health workers to identify the signs and symptoms of neglected tropical diseases of the skin and other common skin conditions through their visible characteristics. Skin diseases are among the most common of all human health afflictions and affect almost 900 million people in the world at any time. Five common conditions account for over 80% of all skin diseases. 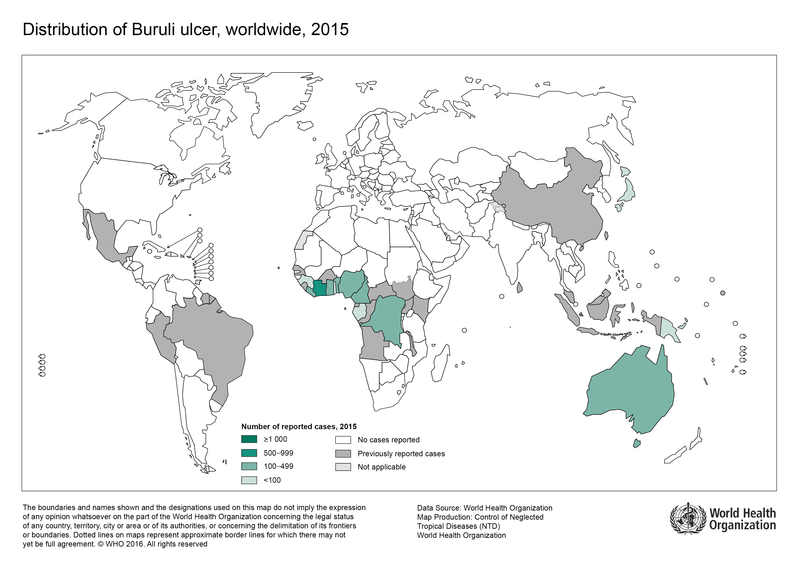 30 September 2015 | Geneva −− The World Health Organization, in collaboration with the Foundation for Innovative New Diagnostics, has started a thorough evaluation of an innovative diagnostic test developed by researchers at Harvard University that can lead to rapid confirmation of Buruli ulcer in a patient.